In the interest of our famed communal spirit as African- Ghanaians, everyone, sit. Just sit down. And lend me your intellect. Or whatever you have for it. If you are not intelligent at all, bare with my literary illustration below. But do not misinterpret my generosity as a tacit admission that I am responsible for your brain malaise. Now, homophonically, the title of this piece of literature is, depending on your Holy Bible proficiency, almost or entirely an affront to scripture. Like when a good televangelist intones that God created him, the Osofo, in his own spitting image and so he is a piece of God. In the absence of a loud preacher man pontificating of his paternity, and sticking to the same homophones bit of wordplay, one could be actually be tempted to liken Ghana’s Shatta Wale as being a piece of God. Before you come assailing me with blasphemy, as if I hadn’t warned you against my total disdain for dumbness and people who are dumb, please pay attention to the following verses. . .
1. 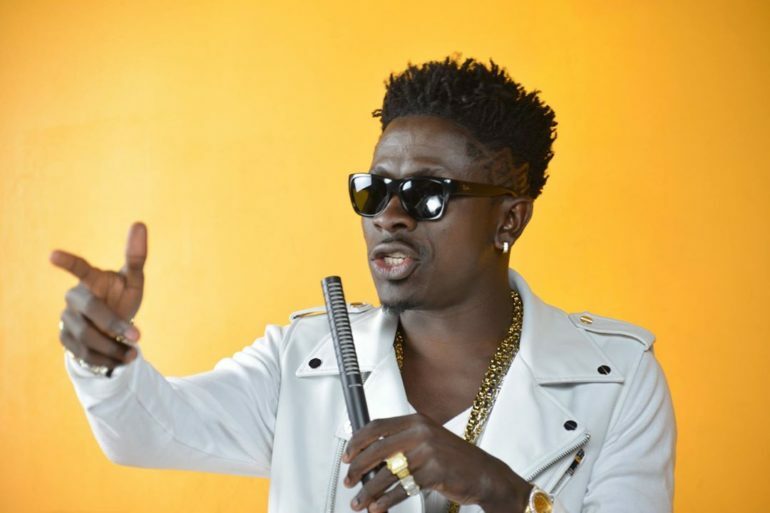 Is Shatta Wale a jealous human being? 2. Is Shatta Wale not filled with fits of rage and fury? 3. Did Shatta Wale not server relations with his Lucifer aka Dupoti? 4. Does Shatta Wale’s acts and decisions make sense to anyone else apart from him? 5. Does Shatta Wale create anything with his thoughts and words? 6. Does Shatta Wale love and expect his followers to sing his praises? 7. Did Shatta Wale not go into the wilderness for 40days and 40nights, sorry. Did Shatta not suffer in the music wilderness here on eartg for 10yrs before he was able to buy his 1st Range Rover? Now imagine Ghana as one beautiful gourd. The fine dried up but well nourished fruit jar that is so blessed that it is called Ghana. Then for some mundane reason, the gourd is given to a grown- looking-responsible-looking spectacled human being like Willi Roi. He is given the gourd to go and fetch water from the nearest river so we all drink and live life as one people. In unity. Then Willi Roi, the same grown man expected to see what the stakes are for an entire nation, drops the gourd. Breaking it into pieces. And smiling at the mess he hath brought upon us. In spite of the shattered gourd, and the stupid grin on Willi’s dumb face, the least I’d expect every Ghanaian to do, would be to identify which piece of the mess is their portion. It of course goes without saying that each piece of the broken gourd, henceforth, becomes autonomous and must look out for him or herself. Ladies, minnows and men, the supposed underlying ethos of Ghana’s sociocultural scheme, is a broken joke. And has been shattered largely by our inactions as an unappreciative philistine bunch who ought to be left to wallow in their ignorance. Just like the Willi Roi story above, my Ghana people, I have seen the Ghanaian, Caroline Sampson’s tweet. The one that calls for Shatta Wale to calm down and support a brother. I. Shatta’s original tweet was in response to rival fans who went goading him for having missed on the BET nomination this year too. II. Caro’s quote/retweet of the Shatta tweet and it’s accompanying remarks/plea was premised on Shatta being petty instead of congratulating his nemesis’ BET recognition. Her tweet though, brings to mind an experience ace satirist and comedian Kwaku Sintim Misa suffered and recounted on stage once. It occurred when he (KSM), first traveled to America and exited JFK Airport. KSM, the ‘JJC’ saw a certain black skinned gentleman sitting across from him idling and since he needed assistance in finding his way into mainland New York, he thought he had found a ‘brother’. According to KSM, that slight mistake on his part, feeling overly entitled to kith and kin, nearly proved fatal. He has since learnt to not mistake any or every black man as family. Relationships, especially the type that has dogged the reason Daddy Lumba and Kwadwo Antwi are yet to be featured on the same track, blood or not, are nurtured. That almost always means years of co existence. You don’t just stumble into ‘friendship’ or ‘brotherhood’. Now, without being tagged a sexist, I’d be sincere and admit that, if God doesn’t come from heaven tomorrow, he should bless me with an opportunity to see and weigh the size of the fine pair of balls my sister Caroline has grown. Suffice to say, Caroline knows how tight her family ties with Shatta is. And so could hazard the poke at Shatta on Twitter. Regardless, I still want to see her balls. And weigh them. . . Nonetheless, with all the love I have for Caro, when did Shatta become family with Stonebowy and we missed the party? Or who told my Caro that Stonebowy needs Shatta for anything? Can we stop this ‘brotherhood’ play thing? Brotherliness stopped being what the Bible defines it to be centuries before friendship on Facebook meant nothing more than a borrowed adjective. Without delving into cultural differences and the anthropological tendencies of nationals of Ghana and Nigerian, let me tell you what the fact is: the much touted unity amongst Nigerian artist isn’t entirely sacrosanct. Neither is it exclusively Nigerian. Both WizKid(Wizzy) and Davido are like Ghana’s Stonebowy, former winners of the BET Award. Davido has since news broke, called on his fans to vote massively to enable him win it again against Wizzy and at the expense of the other nominees ( 3 South Africans +1 Ghanaian+ 3 Nigerians) . Wizzy is yet to announce to his millions of followers, his BET nomination. Quite clearly, he has out grown the back stage Award presentation. And has rather congratulated his ‘small boy’ Mr Eazi via Twitter. Davido has NOT congratulated his fellow ‘Nigerian brother’ Mr Eazi. Neither has he congratulated any of the remaining Nigerians listed in the category. Unity or anarchy or ‘brotherliness’? Yes, they would unite and bond against any other creed that isn’t ‘naija’. But go and check what fans of Wiz Kid are doing to Davido’s followers since the Star Boi tweeted the 7 nominations his Drake assisted ‘One Dance’ song has garnered at the recently released list by the Billboard Music Awards 2017. It has been over 30hrs since new broke to confirm the good news or confirm the bad news – depending on whether you are an #SM4LYF or #BhimNative. But judging from the comments/posts/tweets provoked by Stonebowy’s BET Awards nomination, his 2nd in three years, and a well deserved one at that, we are not going anywhere. Yes, we ain’t. It is not like we were originally, going somewhere, anyway. So I doubt, and do not suspect that any wise man reading this post shall mistake my stance beyond what it is – an opinion- or as the final nail that seals our fate as a vicious and ill fated people. Our moral decadence and sense of citizenship is neck deep in corrosion. For we are what we are: vicious and ill fated . Ideally, Ghanaian musicians’ mother welfare body Musiga should in the very least, have via social media, lead the chorus of congratulatory messages. Then the political office – ministry in charge of Creative Arts, after getting the hint, because they can’t know what is necessary don’t even know what tourist mileage the nation stands to gain, would follow suit. Ghana. Quite obviously, they would sleep well if any other person is crowned the winner than their Ghanaian ‘brother’ Stonebowy . And shall live happily ever after. Communal tidings be damned. Whilst we are at it, I commend all the industry players who have expressed their thoughts on the matter. Including the curses a certain old and former musician Willi Roy has piled on Citi FM’s art journalist Mr Kwame Dadzie for nudging him to stop playing the fool – apropos- the former’s counsel to Ghana’s ‘BET Awards hopeful’ and musician, Mr Shatta Wale. I have also read the supposed wisdom from arts guru KKD that is nearly themed on the act by Nigerian ‘Star Boi’ WidKid’s congratulatory tweet to his fellow BET 2017 nominee and ‘Ghajerian’ Mister Ezi. What KKD, the former state property and inmate of the Airport Police Station refused to educate himself on is the tiny bit of Mr. Eazi being Wizzy’s signed artist. Or as per Caro’s logic, Wizzy is Mr Eazi dad? Oh, they are ‘Brothers’? I see. Truth is, these positions from especially my very good former Facebook friend KKD hasn’t actually got my monkeys up in spite of the blatant disregard for status quo and basic human relations. Nor has the teeming fans of both protagonists’ over indulgence in matters that are simply illiterate and petty. Or even our propensity to confuse the both of the above. 1. Shatta doesn’t like Stonebowy. 2. Stonebowy doesn’t love Shatta. 3. Both of these two are highly competitive and hope to be each proclaimed as undisputed by men, God and the devil. 4. They are both NOT members of a singing band of the Ghana Christ Synagogue. 6. The Bhim Nation President and his fans feel Shatta ought to be struck down by lightning or something. Can’t begrudge them. 7. Stonebowy has during the year under review, and on merits, made giant leaps in international music corridors way beyond him. 8. Shatta has during the year under review, not only sustained his cult following but actually transitioned into music climes that hitherto was the preserve of the Lumbas and Kojo Antwis. He has broadened his appeal. 9. These grown men are Ghanaians. Ghanaians don’t support each other. 10. Why are we pretending that the 9th sentence under “Status Quo doesn’t matter or is a myth? 1. When did the memo from heaven instructing Shatta and Stonebowy to be family and friends arrive and the world didn’t get hint of? I. What else must Shatta Wale do to us as a people before we leave him alone so he let’s us celebrate Stonebowy the way he deserves? II. Can you please re #1 under ‘Human Relations’ again? 2. When Stonebowy won the same BET Award category two years ago, did he require the ‘brotherliness’ of Shatta to win? 3. IF Shatta does the unthinkable and wishes Stonebowy well, like Wiz Kid did for his ‘brother’, and doesn’t win, ain’t Ghanaians going to go on an online fooling spree that shall accuse Shatta of ‘bad lucking’ the entire #BhimNation? 4. Can Ghanaians allow a kite to fly and let the crow do same? Ok. Now I have heard stories attributed to certain higher ups suggesting that they the ‘big men’, are those who nominate or hugely inform who makes the final BET IAA category. If indeed, these Ghanaian entertainment gurus are the noble men responsible/tasked with the deed, and haven’t as yet, mentioned or recommended Shatta Wale to organisers of BET, what does that speak of their sense of nationalism, class, professionalism and of ‘brotherhood’. I have also heard the rumoured Charter House/VGMAs influence. I do not believe it. But assuming without admitting that that was the case, wouldn’t it make such people ethically and morally more corrupt than their adversary, Shatta? Do these good and grown persons have a personal issue with Shatta Wale? Do they have a professional issue with Shatta? Must the issue they might have with Shatta inform their professional and unbiased responsibility to BET? Why have these persons, if indeed they do exist, not recused themselves from the BET task because of the likelihood of them being biased against of obviously qualified Shatta? Wouldn’t such an act fetch for them the exclusive and moral rights to shut Shatta down whenever the need arises? With regards to the civil case brought against Shatta Wale by Chatter House’s Mr Ayoade and Co, isn’t that a private matter? Maybe we should all sit down, and check ourselves on why Ghana had only one nominee slot. If our successes depends on ‘brotherhood’, we as a people, don’t have the men. I know there is an ‘economic science’ to the entire scheme and category. When an entertainment guru like King Kwasi Kyei Darkwah who is not just sleek, tenacious and daring bellows “ the negativity expressed in Ghanaian circles is only surpassed by the positivity and goodwill of our Nigerian counterparts”, we mustn’t soak on it. For his thoughts isn’t based on any ‘cultural science’. He is lying and being intellectually dishonest. KKD, like the other hired illiterates must just sit down, get a more descent life and keep their thoughts. That’s if they won’t lead a campaign geared towards allocating Ghana more slots in the category – online in the very least. Nigerians sin different from us Ghanaians, but make no mistake, we are who we are – a failed pupils of humanity. The writer is a former Artist manager and producer. He is currently working on his anthology of poems and his maiden novel.